Fear not, loyal reader. Although you would hardly know it from the silence on the site today, we are still reading very good books here at Caterpickles Central. 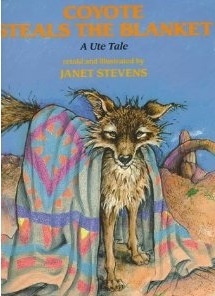 We highly recommend Coyote Steals the Blanket by Janet Stevens. We love it. In fact, we are so very busy loving it we haven’t had any time to write a proper review of it. While you wait for us to stop enjoying ourselves and get back to work, The Five-Year-Old suggests that you hop down to your local library and check out a copy of Coyote Steals the Blanket for yourself. Or, if you are really feeling sour about being cheated out of your Thursday afternoon book review, you can pop over to our sister site, BostonWriters, for a review of The Unquiet Bones by Mel Starr.